Air purifiers help eliminate dust, dander, pollen, mold, and other airborne contaminants that contribute to respiratory issues. Check out our guide for the lowdown on how to pick the best purifier to combat your asthma and allergies. Nobody wants to breathe in dust, dander, pollen, and mold. Unfortunately, though, the air in our homes is loaded with these pollutants, thanks to poor ventilation systems and the use of household chemicals, gas-burning appliances, and smoke-producing tobacco products. The airborne irritants act as allergens and can cause many respiratory issues—especially in those who suffer from asthma and allergies. Air purifiers can help alleviate these negative health effects by removing contaminants from the air. Before you buy one, however, it’s a good idea to consider the following factors to ensure that you’re choosing the best air purifier for allergies. The best air purifiers draw air through one or more filters, which trap the impurities before recirculating clean air back into the room. These machines work in a similar manner to masks worn by surgeons in the operating room: As the surgeons breathe, airborne particles become trapped on the inside surface of the mask, preventing germs from being transmitted from doctor to patient. Both the masks and air purifiers act as filters that allow air to pass through but blocks other damaging particles. Purifiers equipped with high-quality filters can better remove unwanted dust, animal dander, pollen, mold spores, and other pollutants from the air. Air purifiers with high-efficiency particulate air (HEPA) filters are most effective at removing the airborne irritants that plague allergy sufferers. These filters are certified to trap 99.97 percent of all particles of a certain length (0.3 microns or larger). Most pollutants are so microscopic that they can’t be seen by the human eye, so investing in a reliable filter is crucial. The downside of HEPA filters is their replacement cost, which runs anywhere from $25 to $100, depending on size. Some purifiers incorporate additional filters to trap larger particles before they reach the HEPA filter; buying a purifier with this design will help your HEPA filter last longer. • Carbon filters can reduce the amount of some volatile organic compounds (VOCs), which are gaseous particles often found in paint, varnish, cleaning products, carpeting, wood preservatives, and other common household items. These filters can also remove odors. But they, too, must be replaced every few months to maintain effectiveness. For best results, carbon filters should be included as part of the prefiltering system in units that also contain HEPA filters. Ozone-producing air cleaners claim to work by increasing oxygen molecules and activating negative ions to eliminate harmful airborne bacteria. The EPA has determined, however, that ozone is detrimental to the human respiratory system. For that reason, some health experts discourage the use of ozone-producing air cleaners and their use is often regulated. Ion-exchange technology and electrostatic technology can increase the effectiveness of filter-type air purifiers by attracting particles through static electricity and trapping them. When combined with HEPA filtering, these products can be quite effective. They require frequent cleaning, however, to keep them working well. After conducting extensive tests on air purifiers, Consumer Reports warned that some ion-exchange and electrostatic purifiers can emit ozone as a by-product of purifying the air. We recommend checking the purifier’s operating manual (or the information on the box) to ensure that a specific model does not emit ozone. When shopping for a purifier, consider the filter replacement cost as well as the machine’s initial price. An inexpensive unit that requires expensive replacement filters may not be a bargain. Air purifiers with HEPA filters range in price from around $100 for small units to upwards of $900 for high-capacity models with multiple filtering systems that treat large areas. 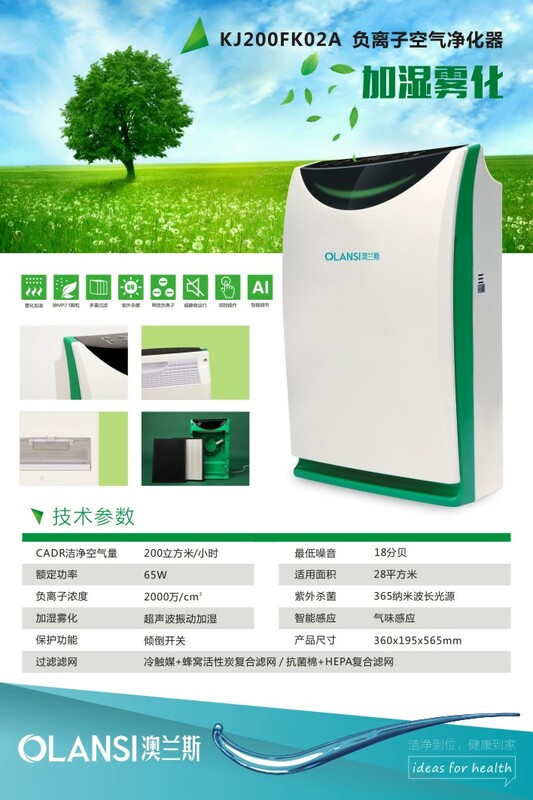 2016-11-11meta-author By china air purifier oem factory Air Purifier News air filtration, Air Purification, Best Air Purifier, clean air purifier, Hepa Air Purifier, Olansi Air Purifier Comments Off on Global Air Purifier Market: Trends, Opportunities and Forecasts (2016 – 2021) is available at ReportsnReports.com. The air purifier market report spreads across 148 pages market drivers, challenges, trends, developments, competitive landscapes and strategic recommendations.